WESTFORD, MA – April 4, 2013 – American Dynamics, part of the Security Products business unit of Tyco (NYSE: TYC), is introducing new ways to manage and interact with VideoEdge video management systems: VideoEdge Hybrid and Desktop/Mini-Tower NVR with VideoEdge Client and victor Express Client. Previously considered relevant mostly to large, enterprise customers, the VideoEdge NVR portfolio has undergone a transformation over the past two years, to include smaller, lower-cost recording platforms, with two new intuitive client solutions. The VideoEdge Hybrid is a powerful, high-performance NVMS that records and manages video from both analog and IP cameras, protecting your video investments. The Desktop/Mini-Tower NVR offers 200Mbps throughput (100Mbps to storage and 100Mbps playback to clients), the highest in the industry. Both recording platforms are ideal choices for small to medium size businesses. For customers securing single sites with multiple recorders, the new victor Express Client introduces a revolutionary way to enjoy the power of video unification without the high price tag or bigger system overhead. 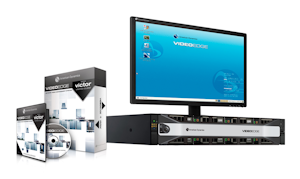 As part of the victor unified client portfolio, victor Express still offers the ability to manage video from multiple Intellex DVRs, and VideoEdge NVR/Hybrids from a single intuitive interface. By removing the victor site manager requirement which provides more enterprise functionality such as command center, access control unification and integrated policy management, victor Express provides single site applications a powerful way to manage multiple recorders. Those enterprise features are available with the victor Professional Client. “Our VideoEdge portfolio has had tremendous success in places such as university and medical campuses, multi-site corporations, and Fortune 500 businesses; so much so, that we’ve been asked by customers in smaller applications for a solution more fitting to their needs. The new Hybrid and Desktop/Mini-Tower NVR with the new clients are the direct result of listening to those customers,” said Shahar Ze’evi, senior product manager for American Dynamics. In addition to the new client solutions, customers can also use the new VideoEdge Go mobile application to view and manage video from any of their recorders, providing powerful visibility on the go. The entire VideoEdge and victor portfolio of video management solutions is available through American Dynamics’ worldwide distribution channel.